As the debate over border security continues, here’s a look at how the recent flow of migrants compares with past migration patterns at the southwest border. All data are from U.S. Customs and Border Protection, the federal agency tasked with patrolling the border. 1 Apprehensions at the U.S.-Mexico border have risen sharply in the first half of the current fiscal year but remain below historical highs. 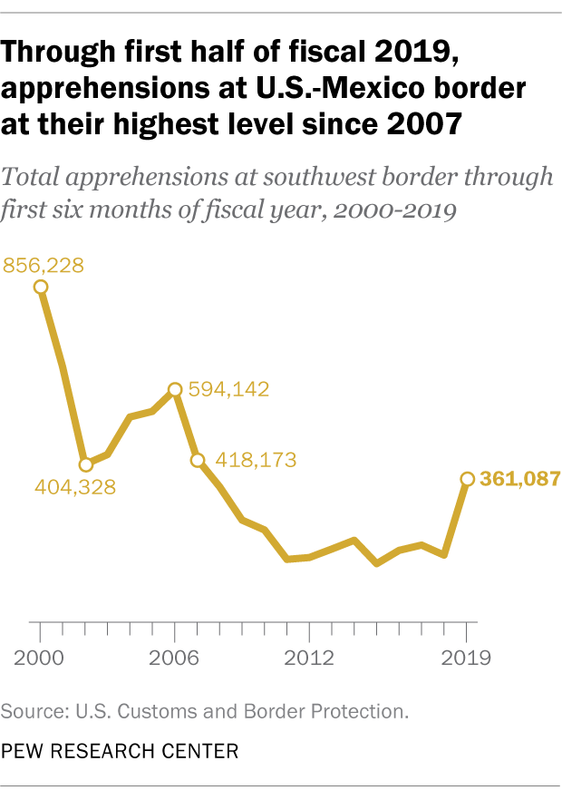 There were 361,087 apprehensions in the first six months of the 2019 fiscal year (October 2018-March 2019) – more than double the number from the same period the previous year and the highest total through the first half of any fiscal year since 2007. Still, this year’s total remains far below the 856,228 apprehensions recorded in the first half of 2000, the peak year. And while the full year total for fiscal 2019 remains to be seen, apprehensions regularly exceeded 1 million per fiscal year during the 1980s, 1990s and 2000s. 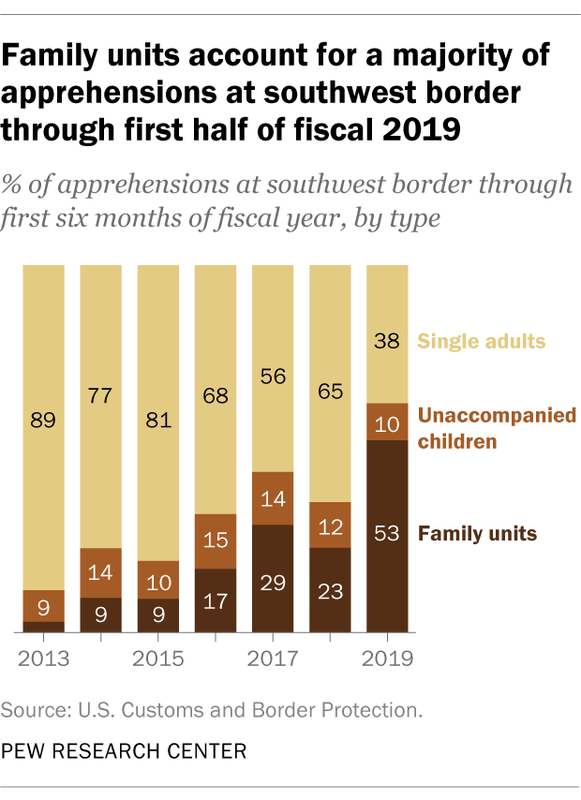 2 People traveling in families accounted for the majority of apprehensions in the first half of this fiscal year, a big shift from the recent past. There were 189,584 apprehensions of “family units” (defined as the number of individuals traveling in a family) in the first six months of fiscal 2019, accounting for 53% of apprehensions overall. In all other recent years, apprehensions of individual adults far outnumbered those of family members or unaccompanied children ages 17 or younger. In fact, the number of family members apprehended so far this fiscal year far exceeds the full year total in every other year for which data are available. People apprehended by the Border Patrol can face various legal outcomes, ranging from expedited removal if they are deemed to be in the country illegally to being granted asylum if they are deemed eligible. Asylum applications have increased substantially in recent years, but acceptance rates have generally remained flat. 3Apprehensions are rising most quickly in the El Paso sector of the border. 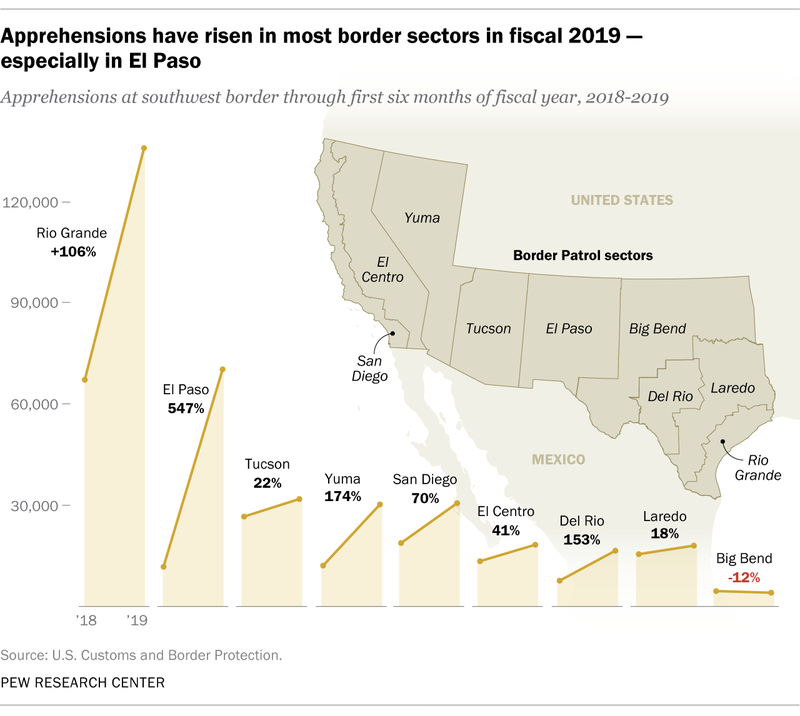 The El Paso region saw a 547% surge in migrant apprehensions in the first half of fiscal 2019 compared with the first half of fiscal 2018 (from 10,975 to 71,063). That’s by far the largest percentage increase of any of the nine southwest Border Patrol sectors. So far this fiscal year, El Paso ranks second in the number of apprehensions only to the Rio Grande sector, which saw an increase of 106% between last year and this year (from 66,351 apprehensions to 136,675). 4 The peak month for apprehensions has changed in recent years. 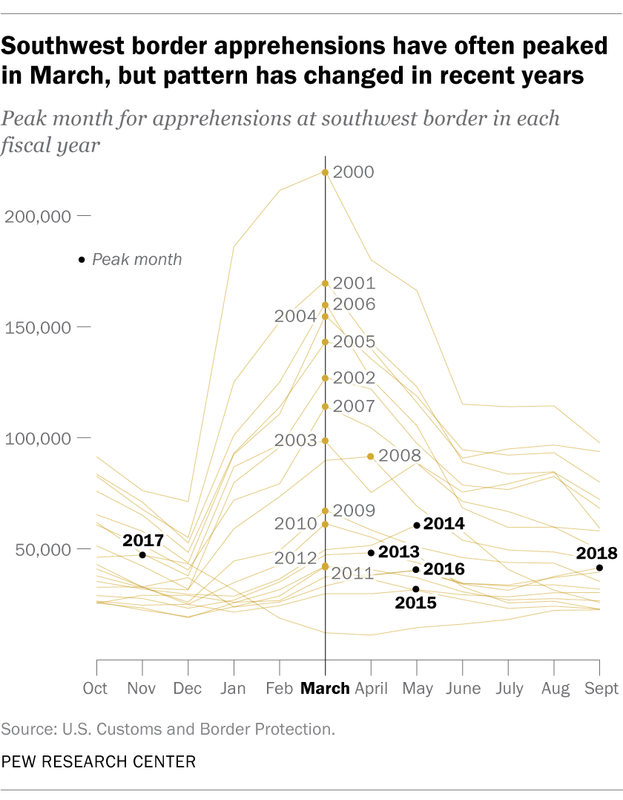 Since 2000, border apprehensions have typically peaked in the spring – most often in March – before declining during the hot summer months, when migration journeys become more perilous. But the pattern has changed since 2013, with the annual peak occurring in months other than March. 5 There has been a major shift in who is being apprehended, with non-Mexicans now outnumbering Mexicans. 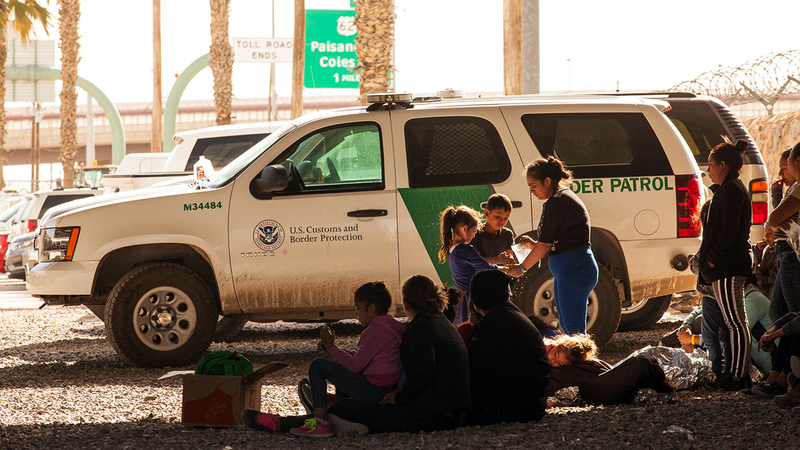 In the first six months of fiscal 2019, border authorities apprehended more non-Mexicans than Mexicans. This continues a recent trend: Non-Mexicans accounted for 62% of apprehensions in all of fiscal 2018, marking the third consecutive year in which they outnumbered Mexicans. 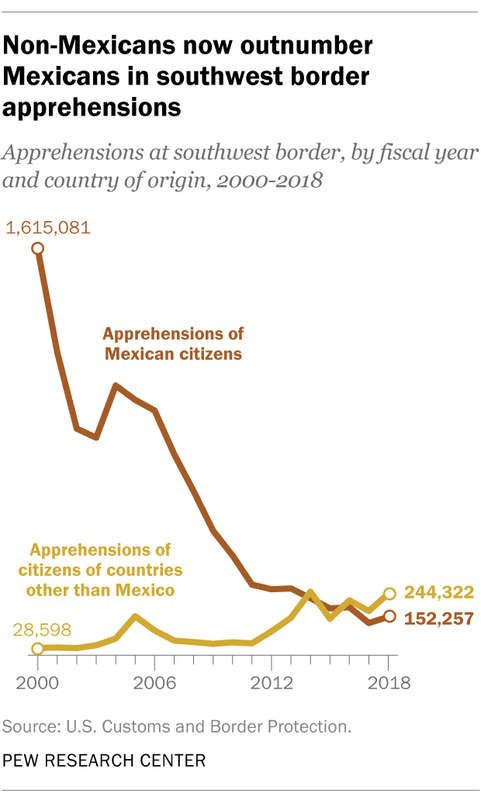 By contrast, in 2000 (the earliest year for which data are available), non-Mexicans accounted for just 2% of apprehensions while Mexicans accounted for 98%. In the last full fiscal year, the Northern Triangle nations of El Salvador, Guatemala and Honduras together accounted for the bulk of apprehensions from countries other than Mexico. There were 115,722 apprehensions from Guatemala, 76,513 from Honduras and 31,369 from El Salvador. The 223,604 combined apprehensions from these three countries outnumbered the 152,257 from Mexico even though their combined population (32.6 million) is only a quarter of Mexico’s (129.2 million). Other countries with a sizable number of apprehensions at the U.S.-Mexico border in fiscal 2018 included India (8,997), Nicaragua (3,282), Brazil (1,504), Ecuador (1,495) and Bangladesh (1,198). The number of apprehensions of people with Indian citizenship was up more than 200% from the year before (when there were 2,943 such apprehensions). 6 The number of Border Patrol agents at the U.S.-Mexico border rose sharply during the late 2000s but has fallen since fiscal 2013. 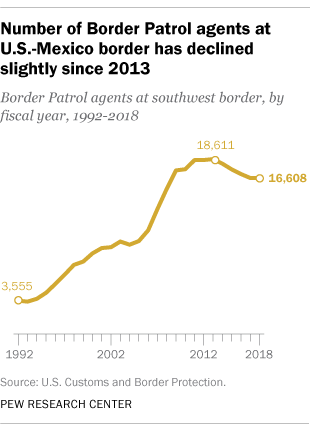 There were 16,608 Border Patrol agents at the border in fiscal 2018, an 11% decline from a peak of 18,611 five years earlier. The reduction follows a large buildup of agents between 2005 and 2011, when their numbers nearly doubled. Border Patrol agents are not the only authorities monitoring the U.S.-Mexico border. Last year, the Defense Department activated up to 4,000 National Guard troops to assist with border security. The federal government also uses a range of other measures to enforce security, from physical barriers to drones. Luis Noe-Bustamante is an intern at Pew Research Center.